I had heard about the existence of these records for years but they eluded me until 1998. A very interesting concept where one could send this stamp, which is still legal for use, on a letter and the person who receives it gets to put it on their record player! Unfortunately, most turntables don't allow the small records to get played as it will eject or the swing of the tone arm is not long enough to complete the record. As there is a market for international novelty stamps, I believe that this set was meant to boost stamp sales for Bhutan. There are about 5 selections of spoken word and music that are repeated in different combinations on each stamp. 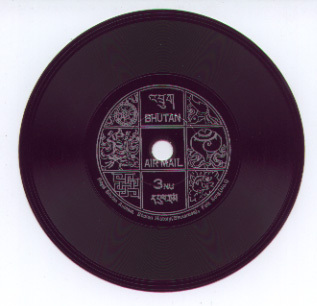 Thin plastic embossed records with removable back to expose adhesive. 33 1/3, 1972.